Roddy Parks has had an interesting few turns in his tennis life. Growing up in Las Vegas, Nevada, Parks was a friend and court competitor of a young Andre Agassi, long before Agassi moved to the Nick Bollettieri Academy and set the tennis world ablaze a few years later. The two young Las Vegans even paired up to post one of Agassi’s first signature tennis titles, winning the doubles gold ball at the USTA Boys’ 14s National Indoors in Chicago in December 1982. Agassi was 12 then, and Parks was 14, but the memory of that tournament and what it meant for Agassi was so vivid that he included it in his 2009 best-selling autobiography, Open. While Agassi’s and Parks’ tennis careers diverged just after that big win in Chicago, Parks has remained in the game, though much like his famed doubles partner, through a couple of sabbaticals. Parks played at Atlantic Christian College in Wilson, N.C. after high school, met his wife there, and has since carved out a life that has always had tennis as a part of it. 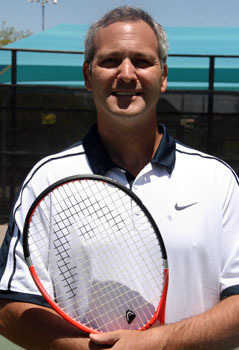 Now 42 and living in Fountain Hills, Ariz., we recently caught up with Parks, who still plays USTA adult tournaments, to see what he remembered most of those young days, about his former doubles partner and what he’s doing now. When did you start playing tennis? RP: I started playing tennis in the summer of 1978 at the Hollywood Park tennis courts in Hollywood, Florida at the age of 9. My dad signed me up for summer camp, and bought me a Bancroft Bjorn Borg racquet with an extra-long extended grip just inviting two hands for the backhand. How long have you been a member of the USTA and what USTA programs have you participated in ---throughout your life (junior tournaments, leagues, adult tournaments, etc.)? RP: I became a member that first summer (1978) and have some interesting memories from a lot of my early USTA tournaments. I remember washing my clothes at a laundromat at the National Hard Court Championships at Balboa Park in San Diego, Ca. and the bums asking me if I had any spare change. Don’t know why I remember that. I also remember getting beat up by a local native in Shreveport, Louisiana over what TV channel was on at the Boys 14’s Nationals. How bizarre are those memories? But what I truly remember most of all is the time I spent with my dad as we traveled the West together in our RV for a lot of events as a young player. Those were great experiences. How has membership in the USTA been of value to you and your tennis game? RP: USTA tournaments have given me the venue to compete and developed my game from a young age. It has also been a very important resource to network with other players. Why do you love tennis? Tennis keeps me mentally and physically fit. It's a lifetime sport and I will play this game for the rest of my life. You grew up in Las Vegas playing tennis with Andre Agassi, a fact not many people know about you. You knew him pretty well as a kid. You two even won a national age group gold ball doubles championship together in December of 1982. What do you especially remember about that week? RP: Flying from Las Vegas with my dad and Andre, I remember how cold and windy it was in Chicago. I remember our toughest match against the undefeated top seeds, too. Andre raised his game to a level I’d never seen him play before and I started playing at a higher level too. You recently got back into tennis you told us after reading Andre’s book, Open. Tell me what exactly it was about the passage about you that made you realize it was time to get back to playing? (Read the passage HERE). RP: I was inspired to find myself mentioned at the beginning of chapter four and it really gave me the desire to start playing again. Andre must have a photographic memory because I could not believe the detailed descriptions. My dad was a true tennis enthusiast and I was happy to see that Andre told of his experience meeting my unique father. 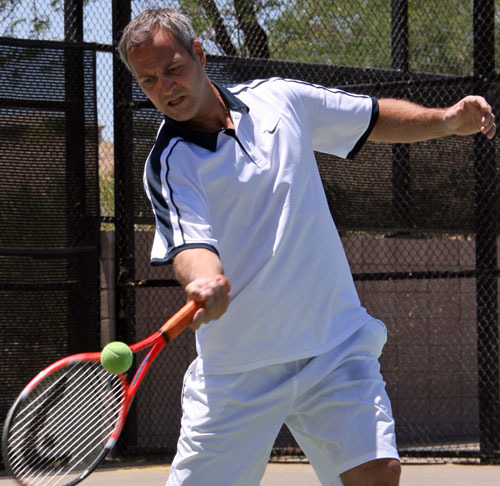 You’re even teaching again (with the Seth Korey Tennis Academy in Scottsdale). How’s that going? RP: It’s only been a few weeks and it’s been great. I really look forward to inspiring others to enjoy tennis. Do you feel like this is your second go around with tennis, coming back to it after taking off so much time? RP: It’s more like my third time around. I stopped playing when I was young because I really didn’t enjoy the lack of camaraderie that tennis players experience at the national level. I came back to play collegiate tennis (Atlantic Christian College in Wilson, N.C.) and then taught for over five years after that. With lack of a true focus, I got discouraged and went on to do other things. After reading Andre’s book, I was inspired with new ideas to come back and teach on a whole new level. RP: It’s given me a good life. I met my wife of 20 years when I played collegiate tennis. We have two sons, Zain, 18 who will be attending the University of Arizona next year and Zarin, 17 who plays varsity football for Fountain Hills High School. We want to feature all of our great stories here at USTA Southwest. 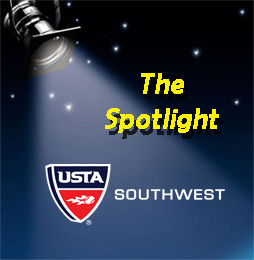 If you know of a USTA Southwest Member (junior, adult, senior, volunteer)or organization (school, facility, service group) that would make for an interesting Spotlight profile, contact USTA Southwest Marketing & Communications Manager Jeff Sikes at sikes@southwest.usta.com or 480-289-2351 x. 109. Members are free to nominate others. Please include a description of why that person would be "spotlight worthy" - and fill out the Member Spotlight Submission Form HERE.